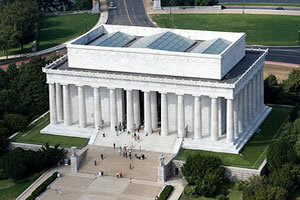 Built to honor Abraham Lincoln, the 16th President of the United States . It is located on the National Mall in Washington, D.C. across from the Washington Monument. The architect was Henry Bacon, the sculptor of the primary statue was Daniel Chester French, and Jules Guerin was the painter of the interior murals. Dedicated in 1922, it is in the form of a Greek Doric temple and contains a large seated sculpture of Abraham Lincoln and inscriptions of two well-known speeches by Lincoln, The Gettysburg Address and his Second Inaugural Address. The memorial has been the site of many famous speeches, including Martin Luther King’s “I Have a Dream” speech, delivered in 1963.